Our church and minister are registered with the General Records Office for Marriages and are committed being of service in our community. 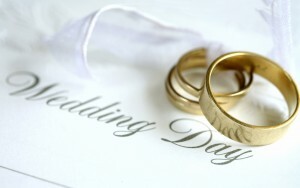 Our aim is to help couples to prepare for their special day and to guide them through the marriage service itself. The Methodist Church, in its celebration of human love, welcomes everyone who is legally eligible, whether or not a member, whether or not previously married. You will find our Church to be attractive and conveniently situated with ample parking on the premises and in the immediate proximity. Our worship area seats a Maximum of 120 people. The costs involved include the hire of the building and fees for an organist, the Minister and stewarding. As of January 2015, these total £355.00. An exact amount will be agreed with the Minister during discussions. Are there rules about where we live? Yes. Normally, at least one of the people getting married should live in the “County of Birmingham” registration district, which (as its name suggests) covers the Birmingham area including Sutton Coldfield. An exception can be made if the church is your ‘normal place of worship’. The registration authorities can also suggest ways in which people, not normally resident in the district, can meet the residence requirements. One of us has been married previously, and divorced. Is this a problem? Some churches are not able to conduct a marriage service for anyone who has been divorced, but the rules of the Methodist Church allow ministers to conduct the marriage of a divorced person if they feel it appropriate to do so. There is no automatic ‘yes’ or ‘no’ answer to this question. It can be resolved only by a conversation with the Minister. Falcon Lodge Methodist Church can also arrange a service of blessing for a couple who have been married in a Civil Ceremony. A conversation would be needed with the Minister. How do we arrange our wedding or Blessing? The first thing to do is to make contact with the Minister. The minister will than arrange to meet you both at the church to talk the matter through.